This topic is important because the Language we use is a reflection of the thoughts that we have. If you don’t like what you are thinking about, change your inner and outer voice and listen to positive words. AND if you are around negative words, and can’t quiet your gremlin voice then a great first step is to change this internal dialogue and external environment and the positive thinking will come. It’s the chicken and the egg between talking and thinking and regardless of where you are at with it all, I think you will get a lot out of our show tonight. 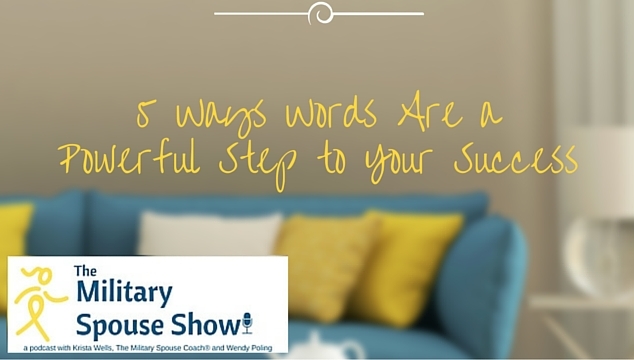 We are going to share 5 tips to get you TALKING YOURSELF INTO SUCCESS! Holly Schlacter, military spouse and Level V leader with Roden + Fields dermatologists.